The therapeutic soap-in-a-bottle that brings you the incredible, natural, anti-bacterial benefits of Certified Organic, pharmaceutical grade, pure Australian Tea Tree Oil, combined with soothing Certified Organic Chamomile Extract and Olive Oil, plus skin-renewing Vitamin E. Freshly scented with select Essential Oils, Jasmine, Orange Blossom and Eucalyptus. There is no other liquid soap like it! Aqua, cocamidopropyl betaine, sodium lauryl sulfoacetate, aloe barbadensis (aloe vera) leaf juice*, celandula officinalis flower extract*, chamomilla recutita (matricaria) flower extract*, hypericum perforatum flower/leaf/stem extract*, lavandula angustifolia (lavender) flower,.leaf/stem extract, salvia officinalis (sage) extract, helianthus annuus (sunflower) seed oil*, melaleuca alternifolia (tea tree) leaf oil, olea europea (olive) fruit oi*, allantoin, lecithin, panthenol, tocopheryl acetate, citric acid, glycerin, lauryl glucoside, sodium chloride, sodium sulfate, stearyl citrate, alcohol, benzyl alcohol, potassium sorbate, sodium benzoate, amyl cinnamal, benzyl salicylate, citronellol, hexyl cinnamal, isoeugenol, fragrance (parfum). 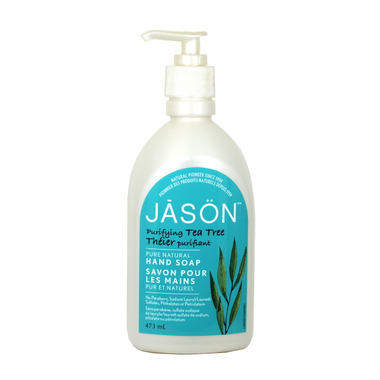 I love Jason soaps and shampoos however this one, I find has just too much scent, for me anyway. Other than that it's nice but I likely will not order this scent again, it's just too strong. I loved the body wash so much thought I would try the hand soap. It's okay but I much prefer the smell of the body wash. I would buy this product again. 4 out of 5 stars. Usually love Jason! But not too keen on the smell of this product. Good price, but disappointd at the smell. Label mentions fragrance and that usually means not natural. Not the best face wash I've used (a little to much on the 'hand soap' side of things) but not bad. Smells great and defintely gets rid of the oil - but is a bit drying so if you're going to use it - be sure to use a moisturizer designed for oily skin as well. Great product ! It smells good and leaves the skin silky, oil-free.